Over the last couple years, The Lupton Center has had the privilege of working with well over 300 organizations from around the country, each with a uniquely fascinating story. There has been one thing, though, we have come to expect from them all. Leaders know the traditional charity paradigm is not working, and they are convinced that the The Lupton Center’s frameworks will be healthier and more effective. After hearing a presentation from one of our trainers, we often hear: “This is great. I’m all in! But… what in the world am I supposed to do now? !” Leaders are often stuck not knowing how to get from where they are to where they want to go. 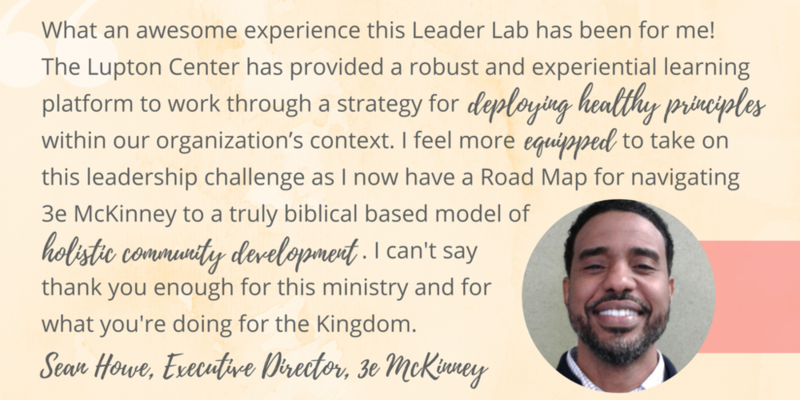 Simply put, the Leaders Lab equips change-makers to make change. We have good news! As of today, the application process for the next cohort is now open! And, even better, in honor of those 300 organizations, if you apply by August 20th, you will save $300! Remember, the Lab is limited to 10 Leaders, so apply right away! If you are ready to have the “What do I do now?” question answered, you can learn more and apply HERE.